This year marks the 100th anniversary of The Boston Post Canes, the ebony walking sticks that were given by the defunct Boston Post newspaper to the oldest residents in hundreds of towns across New England. It's one of the great Yankee traditions that makes this area of the world so unique. Over the years, the canes have been shunned and cherished, lost and found, burned and (perhaps) even buried. Click here to read an article I wrote for The Boston Globe Magazine on the Boston Post Canes. In the article, I mention that the cane for Watertown, Mass., has been recovered after being missing for decades. There will be a ceremony on April 29 at 3 PM at the Edmund Fowle House when the cane will be formally presented to the Watertown Historical Society. Now that the first pitch has been thrown to kick off the baseball season in Boston, it's time for the opening musket shot to be fired as Revolutionary War battle re-enactment season is once again upon us. Patriots Day, which commemorates the battles at Lexington and Concord, is Monday, April 20, but events remembering the battles start this weekend. 1 PM Meriam's Corner Exercise. This re-enactment in a field at Meriam's Corner commemorates a skirmish between the British and the colonists as the British retreated to Boston on the Battle Road. The battle is near the corner of Lexington Road and Old Bedford Road in Concord. Park along the roads. 3 PM Paul Revere Capture Ceremony. Paul Revere Capture Site, Route 2A, Lincoln. More on the capture site here. There's a small parking lot at the site or it's walkable from the Minute Man Park visitor center. 8:30 AM Commemoration of the North Bridge Fight. North Bridge, Concord. Commemoration of the battle on the morning of April 19, 1775. Parking is on Monument Street. 11 AM - 2PM Battle Road Re-enactment. Near Hartwell Tavern, Route 2A Lincoln. There are re-enactors encamped at the Hartwell Tavern and Captain William Smith house and British in full retreat. There are drill and musket demonstrations, crafts, and artillery demonstrations. 6:30 and 7:30 AM Dawn Salute and North Bridge Remembrance Ceremony. North Bridge, Concord. A 21-gun musket and cannon salute at dawn. A 7:30 there are historical speeches and a wreath laying at the bridge. 7:00 PM Paul Revere's Row Re-enactment. Boston National Historical Park Visitor Center, Building 5, Charlestown Navy Yard. A re-creation of Paul Revere's historic row across Boston Harbor to Charleston. 8:00 PM Annual Lantern Ceremony. Old North Church, 193 Salem Street, Boston. The Old North Church hosts its annual lantern ceremony, commemorating the lantern lighting that began Revere's ride. Smart money is on two lanterns being lit this year. 5:oo AM Battle Re-enactment at Lexington Green. 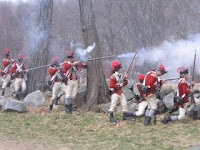 Set your alarm for the re-enactment of the first shots fired in the American Revolution. 9:00 AM Concord Patriots' Day Parade. Starts at Concord Center and passes over the North Bridge, beginning around 9:30, before returning to town. 7:00 PM Battle Road Heroes. Hartwell Tavern, Lincoln. Walk down a candle-lit path and listen to the personal stories of people who lived along the Battle Road on April 19, 1775. $5 per person and $10 per family. For more information on events, visit the Minute Man National Historical Park web site. For more information on events related to the Old North Church lantern and Revere's ride, visit the Freedom Trail web site. What's New at Fenway Park for 2009? When Fenway Park opens its doors on Monday for its 98th Opening Day, fans are in for a big thrill. New concrete! While the Yankees were engaging in its own economic stimulus plan by dumping nearly half a billion dollars on CC Sabathia, A.J. Burnett, and Mark Teixeria (and, oh yeah, opening a brand new stadium), the Red Sox invested in repairing and waterproofing the concrete seating bowl between sections 14 and 28. OK, so it's not as exciting, but the measure will help to preserve Fenway for use for the next 40 to 50 years, so that's worth something. Right? New seats in lower bowl. Along with the lower seating bowl repairs between sections 14 and 28, new seats have been installed. All Field Box Seats were replaced by seats with cushioned bottoms and cup holders. Loge Box Seats that were replaced now have cup-holders. Wooden seats in the grandstand have been refurbished. Good news for your kneecaps: the seats have been fitted with springs that will allow them to retract automatically when empty. Right field roof box expansion. The 383 Right Field Roof Box seats have been ripped out and replaced by 574 new seats. In addition, there are 100 dedicated standing room spaces with drink rails. There are expanded concession stands and restrooms as well. Providing a bookend to the Coca-Cola sign in left field is a neon sign featuring the logo of Cumberland Farms. New concession items. Fans buying concessions at the Jordan's Third Base Deck will find a new Surf and Turf Grill with shrimp rolls and steak tips. There are also chicken and beef tacos and burritos, boneless chicken wings, a bag of three sliders, and "gobbler sandwiches" made with turkey, stuffing, gravy, and cranberry (that will sound wonderful on a steamy, 95-degree day game in July). Fenway Frank recipe. Kayem Foods has taken over the contract to make Fenway Franks. According to an article The Boston Globe, Kayem will unveil a new, bolder recipe. Here's hoping they didn't tinker with the secret, salty ingredient: 86 years of tears from men, women, and children across New England. I guess since the Curse is gone, it's time to change the recipe. Fenway Family Hour reduced concession prices. In April, nine food items will be up to 50% off for the first hour after gates open (gates open two hours before the first pitch). The items are Fenway Franks, pizza slices, pretzels, popcorn, cotton candy, fruit cupes, veggie cups, slider bags, and ice cream cups. Meet an active player or coach. In past years the Sox have had a former player available at Autograph Alley to sign autographs, but beginning with the second homestand the Sox will host 30-minute sessions once a homestand where fans can meet and take photos with an active player or coach. Now we know why Manny wanted out of town. Early entrance for some fans. Citizens of Red Sox Nation, the team's fan club, with a valid game ticket will have the opportunity to enter the ballpark early through Gate C and watch the Sox take batting practice from the Green Monster Seats. Fenway "First Timers." Fans on their inaugural visit to Fenway can go to any Fan Information Booth and get a special First-Timer sticker, a FanFoto voucher for a free personal or family photograph, and sign up for a free welcome message on the scoreboard. For pregame and postgame options, the biggest addition in the neighborhood is the opening of the House of Blues on Lansdowne Street behind the Green Monster. In addition to live entertainment, the House of Blues serves food. The biggest loss to the neighborhood in the offseason was a January fire that tore through six restaurants on Peterborough Street, including Sorento's, El Pelon Taqueria, and Thornton's Fenway Grille. The McDonald's on Boylston Street has apparently just closed as well. The one big thing that hasn't changed this year: ticket prices (finally) and concession prices. Just about the only benefit of the economic downturn. Hopefully, the quality of the play on the field stays the same as well. Go Sox! For more information on getting tickets, food and drink options inside and outside Fenway, getting autographs, increasing your odds of catching a foul ball and getting on TV, saving some cash at the game, and much more on having a great day at a Sox game, pre-order a copy of The Die-Hard Sports Fan's Guide to Boston. Encouraging article in The Boston Globe today about some local, independent bookstores that are holding their own in the economic downturn. It's nice to see some good news about the publishing industry for a change. The main focus of the article is the Brookline Booksmith in Coolidge Corner. It's a great bookstore, and as an added bonus, there is a used bookstore in the basement. Also mentions Newtonville Books, another one of my favorites. Back Pages Books in Waltham is another one to check out. I definitely encourage anyone to support these local, independent bookstores.